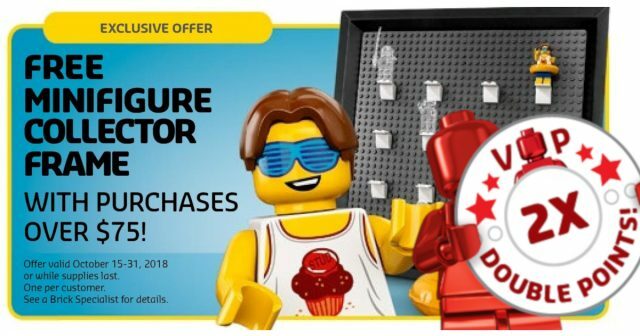 Along with double VIP points, LEGO is offering a free minifigure collector frame as a gift with any purchase more than $75. The promotion runs through the 31st or while supplies last. To see all the most recent sets released by LEGO, check our list of new October sets as well as all the new sets from the summer. 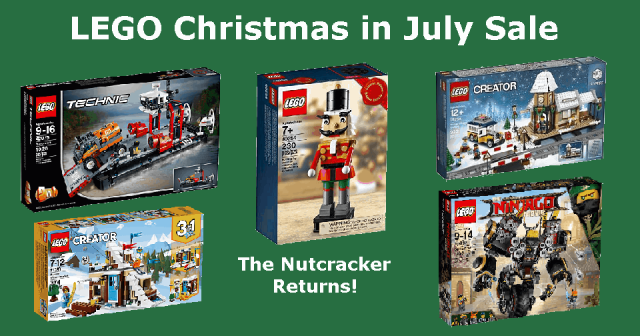 It is time to celebrate and do a little holiday shopping because double VIP points have returned to the LEGO Store. It has been a long time since the last blanket 2x VIP points event, with LEGO instead opting for double points on select sets the last few months. If you have been waiting for double points to make bigger purchases like the Hogwarts Castle or Betrayal at Cloud City, now is the time. 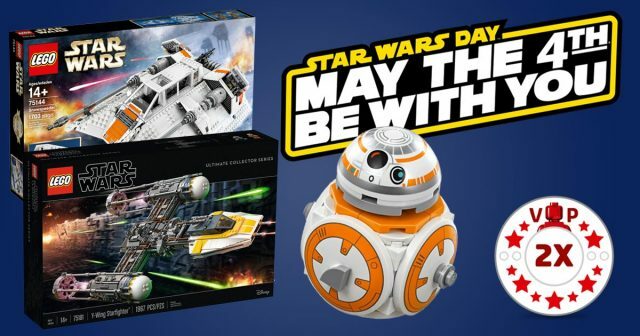 The LEGO Shop‘s sales & deals for May the Fourth 2018 are now online, revealing plenty to make the credits burn a hole in every LEGO Star Wars fan’s pockets. As we noted in our review of 75181 UCS Y-wing Starfighter earlier today, the new UCS set’s launch is the centerpiece for the May the Fourth event. Similarly, all LEGO Star Wars purchases over $75 qualify for a free 40288 BB-8 polybag to go with your R2-D2 from last year. VIP Black Card holders (those who’ve purchased a UCS Millennium Falcon) can use a special code LEGO sent via email to get a Y-wing blueprint with purchases over $35. 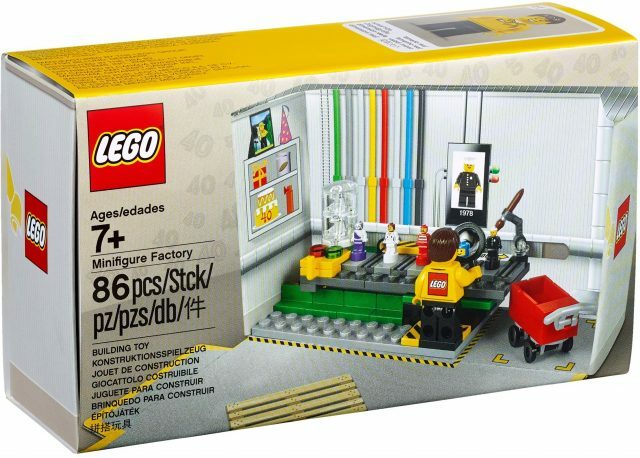 The promotional freebie from the LEGO Store for April 2018 is a Minifigure Factory (set number 5005358). The giveaway includes a LEGO factory worker, along with five micro-figures depicting classic LEGO themes. 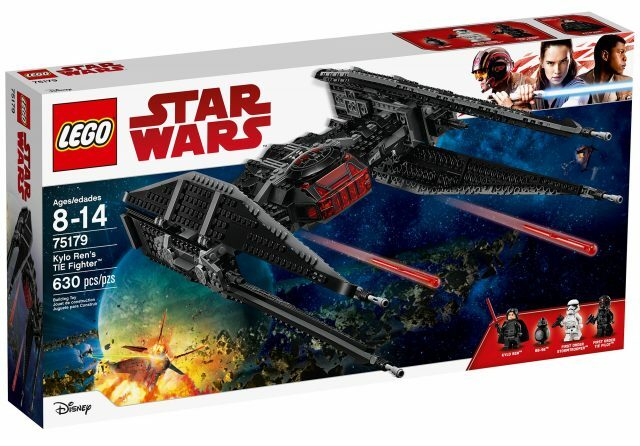 Orders over $75 are eligible, and the promotion runs from April 1st through April 20th (when the next wave of LEGO Star Wars sets from Solo hit stores), or until supplies run out. The micro-figures include the original police officer from 1978, a LEGO Pirates fig with a striped shirt, a blue Classic Space fig, a Ninjago character called Pixel Rebooted, and a doctor from LEGO City. The largest LEGO set of all time, 75192 UCS Millennium Falcon is available again from Amazon.com at the retail price of $799.99 (it has been available from third-party sellers at much higher prices for some time). You can purchase the set now, and it will ship once Amazon gets it back into stock. This availability may only last a few hours at most, so we strongly recommend that you act quickly if you want to pick up this highly sought-after set. 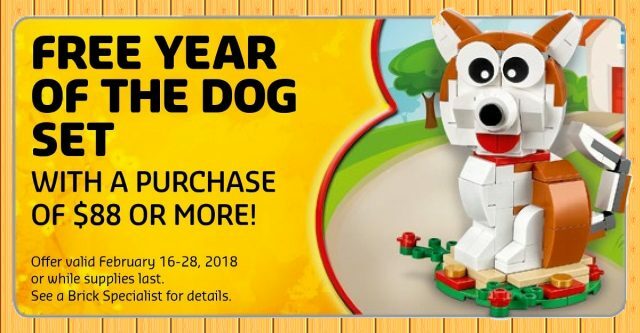 The LEGO Shop online has launched their third major gift with purchase in February, offering this cute, brick-built Shiba-inu in honor of the Lunar New Year. 40235 Year of the Dog is free with orders of $88 or more, a nod that the number 8 is considered to be the luckiest in China and other parts of Asia. 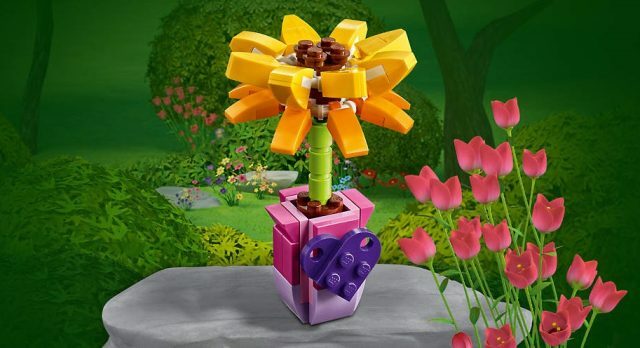 Today only, February 14 make any order of $20 or more, and a beautiful free 30404 LEGO Friends Sunflower set will be automatically added to your shopping bag. This Valentine’s Day freebie is available only at LEGO® Stores and shop.LEGO.com, while supplies last. Can you imagine a better source of yellow and orange slopes than this cute promotional set? 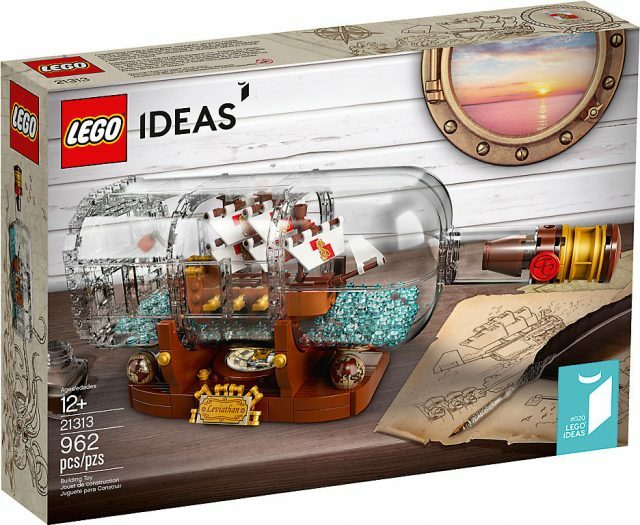 Starting today, LEGO IDEAS 21313 Ship in a Bottle is available at your local LEGO Store and the LEGO Shop online for $69.99. We predict this set will be a popular one, so we are hoping LEGO has the appropriate amount in stock to handle demand. 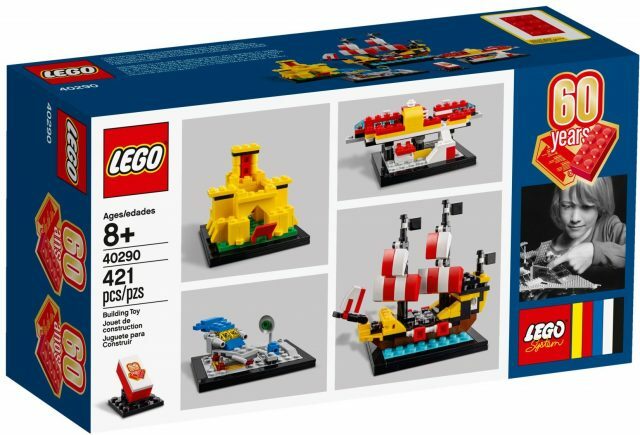 For larger orders of $125 or more, the promotional set 40290 60 Years of the LEGO Brick is still available from the LEGO Shop, so this is a great opportunity to get both amazing sets if you haven’t already. Following the LEGO discounts for Amazon.co.uk, Amazon.com has unveiled its Cyber Monday LEGO deals available now, mostly focused on LEGO Star Wars sets. The discounted sets include several of the new sets from The Force Awakens, along with a significant number of other 2017 sets. Follow this link to check out all of the deals for yourself, but we’ve found a few highlights you might be interested in. 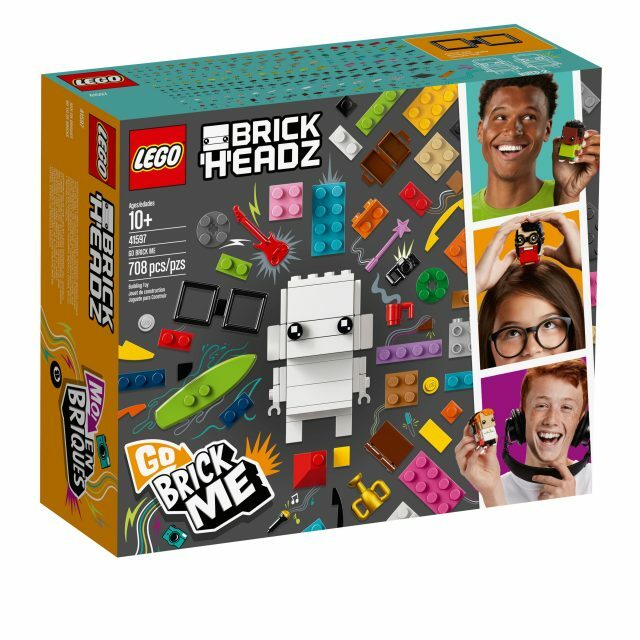 Don’t miss the LEGO.com Black Friday/Cyber Monday deals. These deals may be available in multiple regions, so check them out and save on your holiday shopping while helping to support The Brothers Brick. 75179 Kylo Ren’s Tie Fighter is 20% off at $63.99 and includes the highly sought-after BB-9E (“BB-Hate”) figure.